This legendary Pursuit 3370 is in pristine condition. The perfect crossover family /fishing boat is turn key and ready to go. Her innovative design with sleeping up to 6, protected and enclosed cockpit, 45 gallon live well and all amenities to keep the family and fisherman in the family on top of their game. This Pursuit has a custom passenger helm chair, 5 kw generator, air conditioning,Maxwell windless, Ray Marine E140 touch screen radar/chart plotter. Plenty of rod holders with like new outriggers. Her twin Yamaha 250 HP 4 stroke engines are ready to take you on your next adventure. West Florida Yachts would love to guide you through a personal showing of this 33' Pursuit offshore 2006. This yacht for sale is located in Cape Coral, Florida and priced at $129,500. For a showing please contact us by filling out the form on this page and we will get back to you shortly! This legendary Pursuit 3370 is in pristine condition. 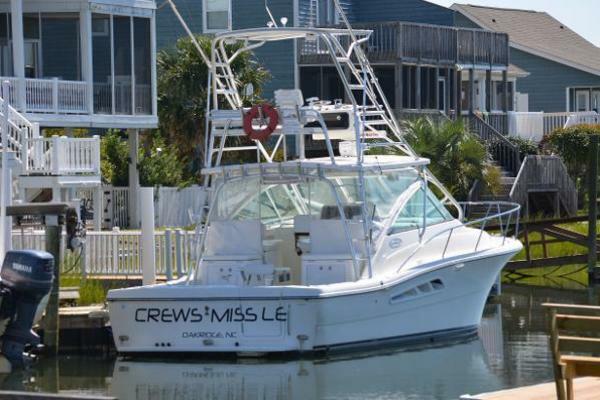 The perfect crossover family /fishing boat is turn key and ready to go. Her innovative design with sleeping up to 6, protected and enclosed cockpit, 45 gallon live well and all amenities to keep the family and fisherman in the family on top of their game. This Pursuit has a custom passenger helm chair, 5 kw generator, air conditioning, Maxwell windless, Ray Marine E140 touch screen radar/chart plotter. Plenty of rod holders with like new outriggers. Her twin Yamaha 250 HP 4 stroke engines are ready to take you on your next adventure. Entering the large cockpit from either port or starboard one finds plenty of room to fish or frolic. There is a fold out aft bench seat with a transom door to the swim platform to port. The live well is directly center stern for easy access.. There is a wet bar & ice maker to starboard. The hard top hosts plenty of rod holders both fixed and adjustable. There are 2 Rupp 23' drop-in outriggers that are virtually brand new. The raw water wash-down is located to port and 30 amp plug in power to starboard. Under gunnels host additional rod storage. Moving forward the helm station and adjacent custom seat to starboard provide comfort while underway. The 3 sided enclosure with hardtop provide protection from the elements. Entering the well appointed cabin you will find the head and galley to port with the comfortable settee to starboard with teak high/low table.The full bunk is located forward and mid cabin bunk under the entry stairs. The cabin deck is teak & holly. Pursuit has done an amazing job of form and comfort with this vessel.